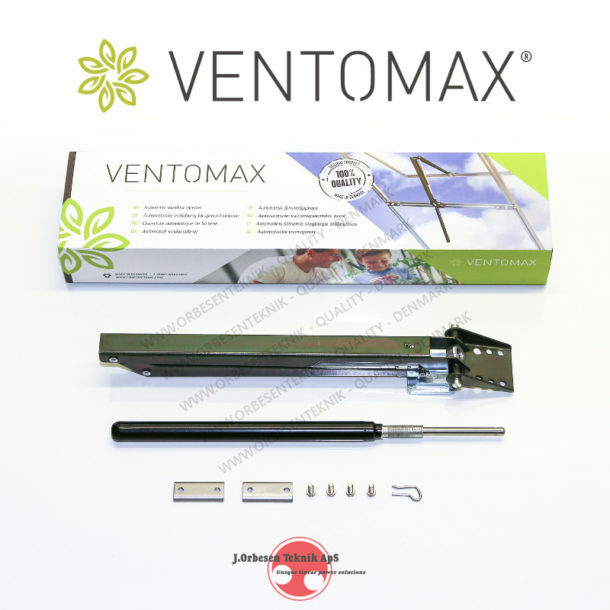 The Ventomax® automatic greenhouse window opener is slender yet powerful. Through many years of production, it has proven its high quality and durability. It is our well-proven standard hydraulic cylinder that is used in the Ventomax® window opener. The unique design of the Ventomax® window opener keeps the hydraulic cylinder inside the greenhouse at all times, no matter the position of the window. Due to this important feature, the window opener will always react on the temperature inside the greenhouse. If the hydraulic cylinder were influenced by the lower outside temperature, the opener might not open the window. This could result in a much too high temperature inside the greenhouse. The long opening stroke of the Ventomax® window opener gives you the possibility of a necessary high ventilation in the greenhouse during warm periods. The larger opening of the window, the more possible ventilation in the greenhouse. In spite of the opener’s simplicity, the design allows you to adjust the temperature where the opener begins to react to the surrounding temperature. This will give you the possibility to adjust the temperature inside the greenhouse in order to give your plants the optimum surrounding temperature. The electro galvanized Ventomax® window opener has a nice green color that has a high degree of corrosion resistance. This will easily make the opener last throughout its whole lifetime.